Management strategies in amyotophic lateral sclerosis - Tanasescu R. et al. Romanian Journal of Neurology, Vol. VI, no. 4, 2007 – retracted due to over 75% text similitude to other published articles. A prospective study of some inflammatory markers in acute stroke: correlations with shortterm occurrence of new cardiovascular events - Tanasescu R. et al. Romanian Journal of Neurology, Vol VII, no. 2, 2008 – retracted due to over 75% text similitude to other published articles and suspicion of data fabrication. Essential tremor – therapy overview - Damian I. et al. T-helper 17 cells in multiple sclerosis and experimental autoimmune encephalomyelitis - Bălaşa R.
Basilar artery stroke secondary to patent foramen ovale: one case report - Deme S.M. et al. Romanian Journal of Neurology, Vol. IX, no. 4, 2010 – retracted for 100% similitude to a published article. First author is banned to publish in RJN for the next 3 years. Mitochondrial myopathies: current diagnosis (II) - Răşanu T. et al. Management of vertigo - Roceanu A. et al. Retracted from the RJN website – it was posted without a formal approval of the Romanian Society of Neuro-Otology (RSNO), authorship was based on RSNO membership since it was intended to be a consensus; first author took responsibility of text similitudes to other articles. This article was never published in print version, being retracted soon after web post. 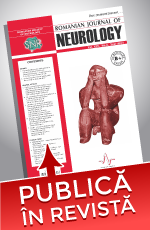 Romanian Journal of Neurology, Vol. X, no 1, 2011 – retracted for 90% similitude to a published article. First author is banned to publish in RJN for the next 3 years.